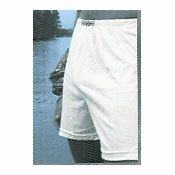 Extra Cushioned Waistband for Lasting Comfort. Fly Opening Has Reinforced Seam Construction. Wide Leg Opening for Comfort and Ease of Movement.